Sign up today to join hundreds of local families who come together twice a year to clear out their clutter & ca$h in BIG!! You can do this!! We have all the tools you need for seller success!! Gather your items, prep, price & tag!! Join our consignor group page for access to quick tips & handy tricks! Drop off your items, shop the Consignor Pre-sale and watch your check grow!! You are on your way to clutter-free closets & ca$h in your pockets!! Earn up to 70% of your sales! JBF Medford Consignors earn an average of over $300 at each sale! • Consignors earn 60% on their sold items, minus a $15 consignor fee per sale event. • Consignors who are able to help during (or before) the sale for at least 4 hours earn 65%-70% on their item sales. Too busy to tag? Try our Valet Service! We do the work for you!! Come join our team.. we have a TON of fun!! Our helpers make each event the perfect place for families to find great deals on the items they need. We LOVE our JBF Team and could not provide this amazing community event without them!! Team Members shop before the public, so you get first pick from the best of the best! Team Members also earn a presale pass to shop the 50% off sale before the public!! You may choose to help out for as many hours as you would like!! Volunteer shifts are available when you register to consign. If you are looking for other ways to help, please contact meganbimat@jbfsale.com... We have options that will work for everyone! Be sure all your items are tagged and ready (see info below) Have clothing & items sorted in size order to help speed up your drop off! 2. Get your presale passes - There’s still time to volunteer!! Earn an extra 5%-10% & get in early! 3. Stop at Inspection tables for clothing & shoes, then place items on the floor in correct locations. At 8:01pm, any remaining items are donated to our charity partner. Sorry, no exceptions! Send a friend and a note if you can't make it and want them to get your items for you. 4. Take all your items with you & proceed to the check-out table. We will double check your bags/items, and have you sign a check-out form before you go. Package: Please zip-tie items to an adult-size hanger. If you would like to place high-priced items (over $20) in our High Value Cabinet near Checkout, please see a volunteer at Drop Off for assistance. Tag: Hole-punch JBF tag and attach it to item with ribbon, string or zip tie. If item contains multiple pieces, be sure all pieces are included and list number of items on JBF tag description. Package: Put bedding/crib/bedroom sets together in original packaging or in giant clear plastic bags. Arrange bedding sets inside bag so that shoppers can see all of the items as well as the design/pattern. *take pictures of the full set and attach to package for shoppers to view without having to open. Secure the bag so that items do not get separated. Bundle blankets, cloths, and towels with ribbon or string like a package (be sure multiple pieces cannot be separated). Books, book sets, board games, puzzles, video games, video game systems, scrapbooks, arts & crafts sets are great items for resale. Please only bring kids’, parenting, homeschooling, pregnancy and child rearing books. Games and puzzles must have all pieces. (No "adult" content please.) Check items to ensure they are in great condition. Price: Prices can range from $.50 to $50 in this category, depending on the item. Price to sell especially for books & DVDs as there are always lots to choose from at the sale. If you would like a high-priced item placed in the High Value Cabinet near Checkout, please see a volunteer during Drop Off. Tag: When tagging books, please attach your tag to the book with tape that can be removed without damaging the item (blue painter's tape works GREAT.) Tape tag to the outside cover of glossy books and to the inside cover of books that will easily tear when removing the tag. Please do not use masking or double sided tape. Hole-punch JBF tag and tie to sets. We sell children's clothing Newborn through size 16 (limit 10 girl's junior size items, high-end brands preferred) as well as maternity sizes (limit 10 maternity clothing items per consignor). Our Spring Sale is spring & summer clothing only (what your child would wear between April-September). Be picky. Look at your clothing items as if you were going to purchase them. No stained or damaged items will be accepted. Any items that look like "mom's" clothes will be rejected at inspection.Please freshly clean your clothing items. Replace missing buttons, sew loose hems and seams, and clip loose threads. Please button all buttons, snap all snaps, zip all zippers before you arrive at drop off. This will ensure that there are no defects in the clothing. The newer the item looks (and the better it smells), the better it will sell. Package & Hang: Hangers - Please hang clothes so the hanger hook points to the left (like a question mark). Hang size 0-6 clothing on child-size hangers and sizes 7-16 and maternity clothing on adult-size hangers. Clothing that falls off the hanger onto the floor does not sell well. Old Navy and many outlet stores are great places to get free hangers (they throw away hangers daily!) and WalMart & Target sell child-size plastic tube hangers at a great price. Clothing Sets - Sets tend to sell better (under size 6) so match things up if you can. All garments should be hung with the hanger hook pointing left (hanger should resemble a question mark when looking at the front of item). Safety pin or use a tagging gun to attach clothing sets securely with bottom garment hung on the backside of the shirt, so both pieces can be viewed without separating them. Pants/Shorts - Pant-clip hangers are great but if you use a standard hanger, simply use your tagging gun to attach pants to the top part of the hanger so the garment will not slide. Onesies, socks, tights, hats and infant mittens need to be in a clear zip-lock bag (you may group multiple items in one bag). Please be sure to label your tag well so that customers know if the items are short-sleeve onesies or long-sleeve onesies. Price: Hanging Clothing- Put outfits/set together to price for at least $3.00; Start at $3 for basic, generic brand 0-24mo outfit. Add $1 each for larger size, name brand, formal, and heavy/winter. Non-hanging Clothing - Put sets together to price for at least $3.00, but okay to price for less (i.e., 6 pair of socks for $1.50). Tag: Clothing on Hangers - Attach tag with a tagging gun or safety pin to the label of shirt or upper right front of pants. Insert the gun in a label or inside seam NOT through part of the clothing (to avoid making a hole or tear in the clothing). Also, pull on the tag to make sure it is properly secured and will not come off easily. Please make sure consignor tags are pulled out of the clothing so they are easily visible to the customers. Non-Hanging Clothing - Please use tagging gun or safety pins to attach tags to onesies, socks, tights, infant mittens, and accessories. Be sure to also attach multiple pieces together. Then put these items into clear zip-lock bags. Please do not tape bags closed - shoppers want to feel and inspect items before purchasing. Household items that other families will use (no knick knacks please). You may consign storage solutions (baskets, bin, shelving), furniture (no upholstered items), decor (lamps, wall hangings, no antiques), and kitchen items (NEW small appliances, utensils, etc.). Price: Price to sell! These items are not the primary reason shoppers come to JBF, so keep the price low! Make sure that shoes are clean, clean, clean! We will be VERY selective with shoes during Consignor Drop Off & Inspection. Shoes must be current season (Fall = October thru March; Spring = April thru September). TOP 10 Selling Items at JBF! Tagging is easier when you have all of the supplies at your finger tips. Chances are, you have most of these items somewhere in your home. Now is the time to gather them up to create your JBF toolbox! The cost of the kit is $25 and they can be picked up locally. If you would just like a TAGGING GUN with BARBS they are available for $10. 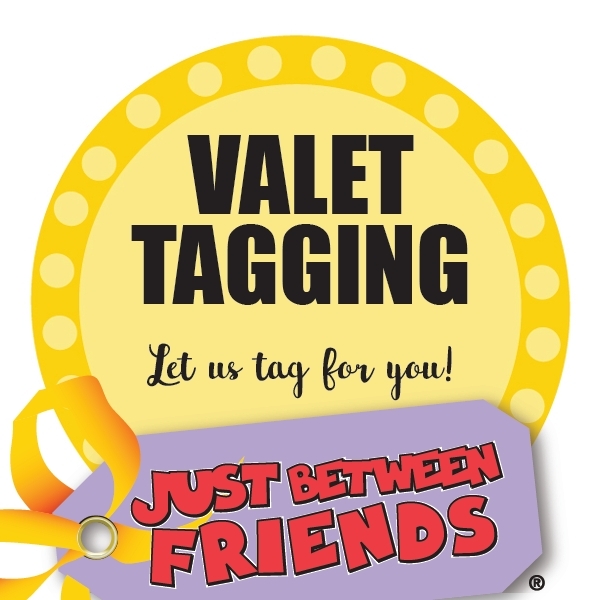 Valet Tagging - We prep your items and you earn 45% cash! All you have to do is bring your, CLEAN, working, pre-sorted items to us. We will prep, price and tag all accepeted items, store them, and deliver them to each season's sale. Valet Consignor spaces are limited & will close when spaces fill—and they DO fill quickly! Email meganbimat@jbfsale.com for more info! !